Palma’s historical courtyards are regarded as one of the most representative architectural elements of Mallorca’s capital. 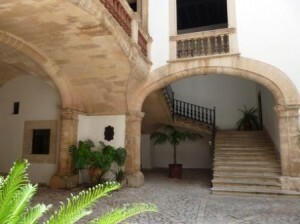 The new guided tours available from 15th September to 30th October will transport guests on a historical journey through some of the most unique and characteristic courtyards of this historical city centre taking in the most typical areas of a traditional Mallorcan manor house. Passing through ancient manor houses, these guided tours offer a unique opportunity to discover some of the architectural jewels of the city which rarely open to the public. The houses that boast these impressive courtyards are all either privately owned or managed by public agencies or educational or cultural institutions. The route is divided into two paths: the courtyards of the upper city or the courtyards of the lower city. Also known as the Can Villalonga-Escalada or Can Sureda-Zanglada, Can Bodils is one of the oldest and most well preserved houses in Palma. Rebuilt in the thirteenth century on Moorish foundations, the renaissance style of the facade windows correspond to a profound reform undertaken in 1554 by the Sureda-Zanglada’s family. Despite its Gothic past, Can Frontera maintains a modernist style due to the reforms made by the owner, engineer Joan Frontera Estelrich in the early twentieth century. A few years ago, this ancient palace was converted into a 5 star hotel. From the courtyard, the staircase is emphasised, starting at the flank of the arch of the entrance. In the XVI and XVII centuries Can Berga was owned by the Santacilia’s family. In 1677, it was passed on to the Berga family. The courtyard is accessed by a portal arch, emblazoned with weapons by sculptor Joan Deyà Berga. In 1942, the building was sold to the Ministry of Justice who are the current owner. The roof of the courtyard consist of four arches resting on eight pillars displaying decorative acanthus leaves and crowns. The house is now used a convent school run by Trinitarian nuns and has undergone numerous reforms in order to be adapted for school use. The route of Palma’s historical courtyards reconfirms the commitment of the Balearic Tourist Board for the cultural promotion of the islands. This initiative aims to facilitate the access to both history and art for locals and tourists alike. Tours are available six days a week in English, Spanish, German and Catalan. 8-Can Frontera. Hotel Ca la Galesa. C/ Miramar, 8. 12-Can Desclapés. La Puresa. C/ Puresa, 12. 13-Cal Comte de la Cova. Escola de Turisme Felipe Moreno. C/Sol,3. 1-Casal Sollerich. Passeig des Born 27. 7-Cal Comte de San Simón. C/ Sant Jaume, 7. 11-Cal Comte de Montenegro. C/ Montenegro, 2. Groups: 35 people max. Estimated duration: 2hrs. Price: 5 Euros.